Note that we do laundry every 8-9 days and please read this whole page. 1 blank white t-shirt for possible fabric painting, tie dye, etc. 2 pair sneakers or 1 sneakers and 1 "tevas"
** International families do not have to send their children with towels, bedsheets, blankets, or pillows. Camp will provide upon arrival. HV Adventures Packing List found here. Suggested: Stuffed animals; photos of family or pets; musical instruments; camera; games, books and/or crafts for rest period. Horseback riders: Bring 1 or 2 extra pair of pants to get dirty, and 1 pair of hard-soled boots with heel (these can double as rain boots or hiking boots). We provide helmets, or you may bring your own. 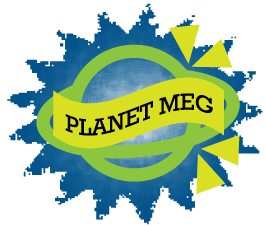 Helpful and cool HVC "stuff" can be found at Planet Meg, the greatest camp store in the galaxy! See right column. We do laundry every 8-9 days, so pack 10 days of clothing in case your camper joins a river hike or “Gross Day” activity. Label all items please: Oliver's Clothing Labels can be accessed via your Online Camp Account. Go to Forms & Documents and scroll to "Your Camper." Optional: (Camp has all of these items available as well.) Fishing gear, costumes for theatre activities, tennis racket, skateboard, tap shoes, guitar, baseball glove, dance music. Personal equipment possession / use / storage: Camp provides equipment needed for any scheduled programs (sports equipment, arts, guitars, etc.) You may choose to bring your own tennis rackets, musical instruments, etc. We can hold on to valuables (musical instruments, etc.) in the office... All potentially dangerous sports equipment or knives will be stored and used under staff supervision. Please do not bring over-the-counter meds (we stock these), cosmetic "make-up", curling irons, jewelry of any value, bikes, pets, weapons, fireworks, gum, or food of any kind unless part of a special diet. Electronics such as gameboys and ipods are for the bus ride only and then will be stored for the session in our office. Please read the note about electronics to the right here and remember that HVC does not permit the possession of kindles, phones, etc. as these items are easily lost or damaged and remove children from group life at camp. Lost Items: Camp is not responsible for lost items, so leave small, unneeded, or complex valuables (jewelry, kindles, etc.) at home! We do not issue refunds for "lost" items, and send "found" belongings home at families' expense. Please be prepared to have a few minor garments (T-shirts, towels, socks, etc.) not arrive back home after a busy active summer. Duffels or footlockers are all OK. All things being equal on your end, footlockers can provide extra storage space once campers arrive. GREAT LUGGAGE PURCHASE OPTION Everything Summer Camp (Home of C & N Footlockers) The name says it all! Find anything your camper might need here, including their popular footlockers and a name-labeling option. Overall, it's best if luggage accompanies children by car, bus, or plane. To home: If you use a shipper, you must make all pickup arrangements and payments ahead of time. Contact us to discuss. Lola and Henry arrived home last night and notwithstanding their lengthy journey home were literally bubbling over with pure joy describing their month at Hidden Valley. From new friends to llamas to the Lion King, to Wheel of Misfortune, and the many wonderful art activities they both participated in, they were effusive in their descriptions and in their pleasure sharing experiences with us. HVC is an informal environment - "the less the better" and no fancy dress clothes are needed. See below left for luggage and shipping tips. To assist laundry staff, please label all items with camper's name. Do not send unnecessary valuable items or anything of sentimental value. Camp is only responsible for lost items if stored in the office. Please note "do not bring..." list below left. Does your child take medication? If so, make sure it is given to a counselor immediately. All medication - even vitamins - must be stored in the HVC Health Lodge where it is available before/after meals, at bed-time or as needed. Does your child wear eye-glasses? If this is the case, please pack a second pair just in case. Does your child wear an orthodontic retainer? Please talk to him/her now about caring for it as part of the camp routine and not losing it. Our "dumpster divers" thank you in advance! Want some camp swag? Orbit to Planet Meg, Hidden Valley’s virtual “camp store.” It features loads of fun HVC items, none of which is a necessity, though a water bottle and "crazy creek" are recommended. Note: We give each camper an HVC T-shirt during the summer season. No ipods, phones, gameboys, etc. 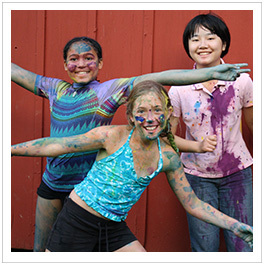 Camp is busy, engaging and filled with the group activities that encourage a thriving children’s community. Campers’ involvement with their groups is not supported by use of these items which are strictly forbidden in camp. When campers want "alone time" at rest period, etc., they are encouraged to read, draw, play games, etc. Please pack accordingly. Please send books. Kindles cannot be accommodated because of limited electrical outlets and the risk of loss or damage. Prep for "no screen time": Take a look at tips for time at camp with no electronics. Take a minute to read HVC's "no devices" philosophy if you like.